Originally made by the Scovill & Adams Co., Solograph cameras first appeared in 1898 and continued to be made after the 1902 merger that created the Anthony & Scovill Company. The Solograph body pattern is based on the popular self-casing plate camera designs of the 1890s. Unlike traditional plate cameras, Solographs have distinctive, square-shaped metal posts for the front standard. 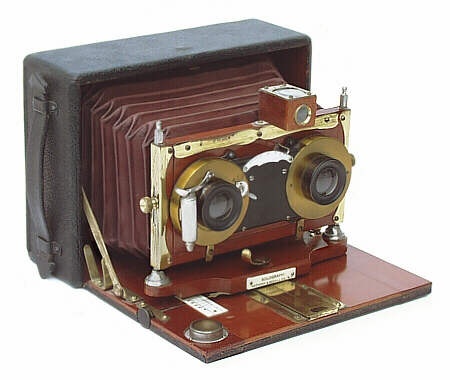 According to Bill Marder's book on Anthony, Solograph cameras were the first folding plate cameras produced with the Anthony & Scovill name (1902 - 1907). A number of models were made, but the line was discontinued in 1907 when the company changed its name to Ansco. 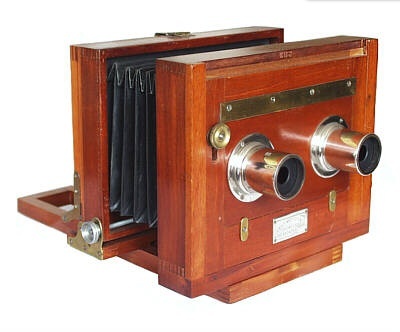 The Stereo Solograph is a 4-1/2" x 6-1/2" format self-casing camera made with red Russian leather bellows, seal grain leather, and lacquered brass hardware. This particular camera has the "Anthony & Scovill Co. NY" maker's label and single achromat lenses mounted in a Bausch & Lomb stereo shutter. Higher end versions of the single lens and stereo models were offered with more expensive rapid rectilinear lenses and Solograph or Winner shutters. The Anthony & Scovill Company, NY.